You love Rocco’s wonderfully fragrant olive oil at the restaurant, now enjoy it at home! 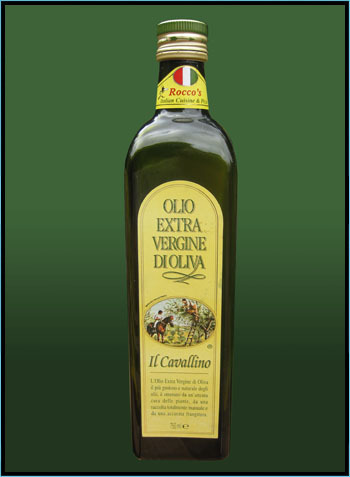 Rocco’s is pleased to offer a limited production of premium-quality, extra virgin olive oil “Il Cavallino”. Imported from Tuscany, Rocco’s extra virgin olive oil has a special, incomparable taste that is admired the world over. When in the restaurant, be sure to pick up a bottle ($13.99) to savor at home or call the restaurant directly to have one sent to you.